If you don't know what Minecraft is then..well...what can I say. Actually your life is probably fine and dandy and if you haven't a clue then I salute you! For those of us who are in the know, then I hope this post gives you a few ideas if you fancy staging one for yourself. 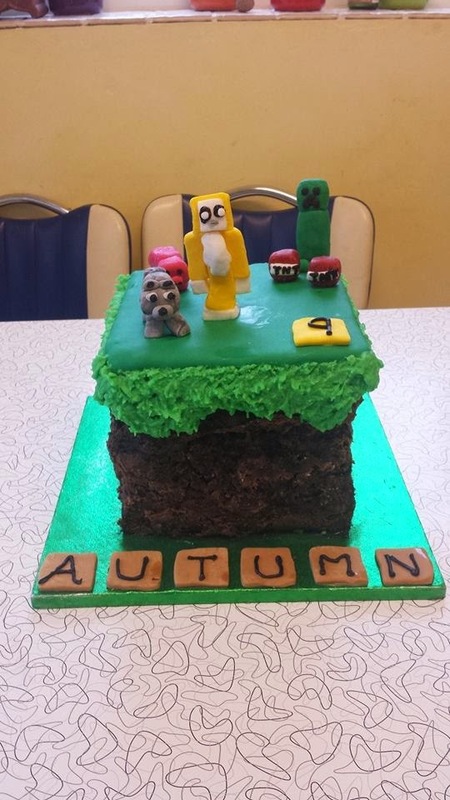 I have to say whilst there are loads of images for Minecraft cakes there isn't a huge stash of party supplies for Minecraft, however, there are some fabulous blogs out there giving great links to various Minecraft ideas. In particular, I like this one by MineMum where I was directed to free Minecraft invites that I could print off and other great ideas. My brief was "I want Stampy LongNose, a creeper and dog figure. I think I filled the brief. So, firstly the cake. I managed to steer clear of using lots of little squares. I copied this cake idea from the vast selection of Minecraft cakes on google. I made this out of 3 chocolate cakes and literally threw it together in my trade mark bish, bosh, bash style when I have to make a cake during half term. I put oreos in there, blackcurrent jam and covered the outside with chocolate butter cream with smashed up oreos to create a soil effect. I also had some black edible dust kicking around (as you do) so dabbed that on too. The top was pretty straightforward a square of green fondant and then green piping for the grass. Mental note to self and everybody out there adding colour makes buttercream go runny. I always forget. Then I added the figures which I hated doing as my daughter kept interrupting me every 10 minutes to see how I was getting on. They were all booted outside in the garden at this point. 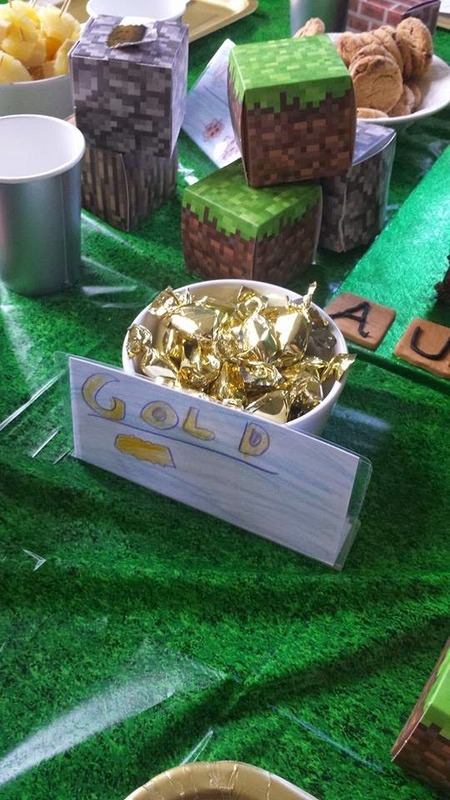 For the Minecraft decorations, my daughter had made little signs like "gold" and "sticks" which we laminated and placed by the food. I ordered a green grass effect table cloth, creepy balloons, gold and silver paper plates/cups (as per daughter's instructions). Luckily a friend had off loaded her Minecraft paper boxes when she moved house which was perfect for putting on the table for decorations. We also used those boxes in pass the parcel with a chocolate inside. Square sandwiches and lots of blocks! Now I'm not one for staging parties and what not but even I was impressed with myself! We used a treasure chest pinata and took off the pirate sign. The balloon time helium pack was perfect for the finishing touches. It only retails at £22 and you get 30 balloons included. I already had balloons but I will keep the ones in the box for future parties. At first myself and the hubster thought the tank was empty. This is because we don't do reading instructions even if they are basic. Its very simple. You put the balloon over the nozzle turn the tap and then push down on the valve to inflate the balloon (we omitted to do that part in the first instance). Once you do a few you soon get up to speed. I think you do need another pair of hands to tie the balloon etc. After actually reading the instructions the balloons started to fill up! We used all our Minecraft balloons and still have enough helium left over for my son's party in May. Given that I have often spent £6 to get two special balloons filled up at my local shop - I think this is fantastic value for money and will probably never have a party again without this handy kit. I did think mmmm but I bet its a bugger to recycle. Fear not though - on the website it details how to recycle the cylinder - you do need a few handy bob the builder tools but seeing as my husband is Bob the Builder this isn't going to be a problem. One Happy 9 year old - I'm liking my new face! I'm working with BritMums and Balloon Time as part of the "Celebration Club", highlighting inventive and fun ways of using balloons. I was provided with a Balloon Time helium kit and have been compensated for my time. All editorial and opinions are my own. Really impressed with the creativity you showed for what looks like a great celebration. Know all about Minecraft - I don't get a choice. Good to hear how you got on. Commenting for myself and on behalf of BritMums and thanking you for taking part.